This super premium, Australian made, canned dog food is complete and balanced to support the health and wellbeing of your adult dog. It is fortified with beneficial nutrients including antioxidants to help strengthen the immune system, zinc and linoleic acid for healthy skin and a shiny coat, as well as prebiotic fibres to promote healthy bacteria in the gut for better digestive health and smaller, firmer stools. 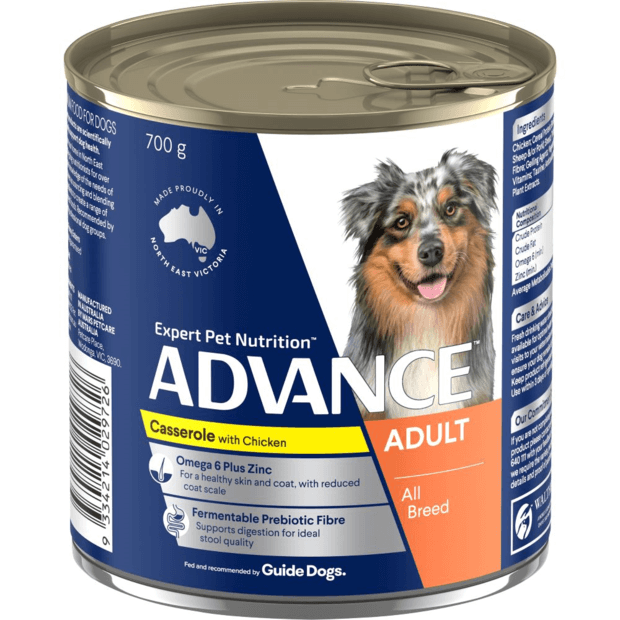 Advance Adult All Breed Casserole with Chicken contains controlled levels of minerals and is highly digestible to help reduce the risk of lower urinary tract disease. Looking for a different canned food formula? 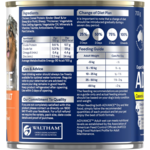 Check out our full range of Advance wet food formulas for dogs. Need to stock up on dry food too? 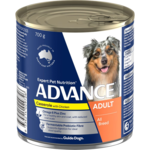 Have a look at our selection of Advance dry food for dogs. Chicken; Cereal Protein; Beef; Maize; Gelling Agents; Vegetable Fibre; Vegetable Oil; Flavours; Minerals (Zinc Sulphate, Manganese Sulphate); Taurine; Plant Extracts (Marigold Powder, Tomato Powder, Lucerne Meal); Vitamins (D, E, B1, B6); Choline Chloride. This is our dogs favorite flavor - they love it. It’s really easy to get out of the can. Product smells bad and looked/smelled like the Dry dog food drowned in Gravy. Couldn't even see the vegetables. Dogs were less then impressed and i'm glad I on;y purchased a small batch to test. Dogs ended up with sloppy poop and were lethargic. Will not be buying this overpriced Gravy in the future. Will be sticking to a brand I trust, Black Hawk as their food looks and smells as good as the dogs seem to think it taste.